By guest writer | March 9, 2019 | This post may contain affiliate links, which means we may receive a small commission, at no cost to you, if you make a purchase through a link. Read our Disclosure. Looking for travel tips on what to do in Denver, Colorado? As part of our city guides series we interviewed John Andrew who is a Denver native, born and raised, leaving only to spend a few years away at university. Denver maintains an air of the unknown; most visitors only see it on their way to or from the legendary ski resorts in the Colorado Rocky Mountains – if they see it at all. It does not have the robust tourism industry of some other American cities, but it is a city with new surprises waiting to be discovered by the intrepid traveler. First and foremost, Denver is an active city. It is consistently ranked at the top of ‘healthiest city‘ lists and it is the capital city of the least obese state in the United States, Colorado. Denver residents love the outdoors and take advantage of the abundant sunshine and access to world class hiking, cycling, rafting, rock climbing, and skiing in their own backyard. 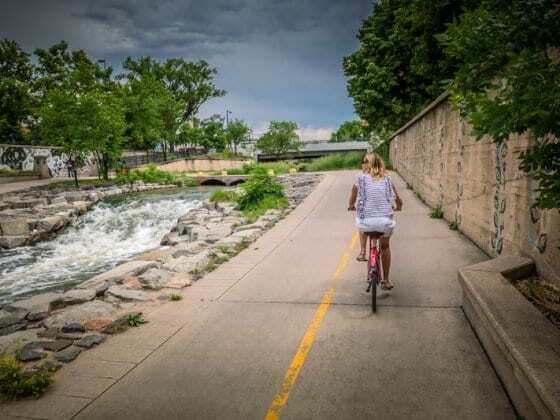 Denver is a city that seeks adventure, and the best way to experience Denver is to get outside – run the trails, cycle the roads, or take a kayak down the rapids that run right through the middle of downtown. Denver has many of the same attractions and amenities of most major US cities with the added bonus of being at the foot of the largest mountain range in North America – reaping all the benefits that go along with that distinction. There are a few ways to experience the natural beauty of the Rocky Mountains while staying close to the city. Red Rocks Amphitheater – A world famous concert venue located in the hills above Denver. Towering red rock formations create a natural amphitheater with amazing acoustics. Some enterprising individuals added seating and a stage to turn it into one the most unique concert venues in the world. The stage has seen countless legendary performers including The Beatles, U2, and Jimi Hendrix. Though a concert is the best way to experience the venue, it is open to the public for free when there aren’t any concerts. Mount Evans – Colorado is home to 53 14,000 foot (4260 meter) mountains and is often referred to as the ‘Roof of America’. Though you can summit every one of Colorado’s ‘14ers’ via hiking and climbing, Mount Evans offers the unique distinction of offering a road to the top. Visitors can hop in their car and summit one of the tallest mountains in North America with their automobile. Along the way there are numerous scenic overlooks and plenty of wildlife including the famous Mountain Goats who are always willing to pose for a picture. Confluence Park – Located right downtown, confluence park offers a scene of nature in the middle of the city. Located at the confluence of the Cherry Creek and the South Platte River, Confluence Park offers a kayaking course, city and mountain views, running and cycling trails, and the flagship REI store, a mecca for outdoor sports enthusiasts. Capitol Hill – A vibrant and funky neighborhood southeast of downtown that is also one of Denver’s most diverse. Around the gold-domed state capitol building, stately 19th century mansions mingle with mid-century apartment buildings and punk-rock clubs line the same streets as high-end restaurants. The neighborhood is flanked by two of Denver’s best parks, the Greek Revival styled Civic Center Park and the spooky Cheesman Park – which still contains many bodies buried underneath from its past life as a cemetery. Lodo – The oldest neighborhood in Denver, Lodo is where Denver started. Old brick warehouses have since been converted into eclectic restaurants, trendy nightspots, high-end loft apartments, and boutique retail shops. The 16th Street Mall is a pedestrian-only shopping district and general hub of activity connecting Lodo to the Central Business District and Capitol Hill neighborhoods. Highland – The Highland neighborhood is adjacent to downtown but offers a more residential experience than some of its other neighbors. Historic turn-of-the-century brownstones stand side by side with ultra modern multi-level town homes along the broad, leafy avenues that characterize the neighborhood. Quiet coffee shops, neighborhood bistros, and pubs each claim their share of regular local visitors. I’ll be the first to admit that Denver is not a food city; food is simply not one of the city’s strengths. But there are still plenty of unique Denver cuisines to try and restaurants to visit. Mexican food and wild game are local specialties, with green chile being the quintessential Denver ingredient. Rocky Mountain oysters (deep fried bull testicles) are a regional delicacy, though we usually only order it for our out-of-town guests to watch them squirm. Tocabe – An American Indian eatery where the speciality is fry bread tacos served with shredded bison. Topped with hominy and corn salsas, these tacos are unlike any others. Cherry Cricket – A landmark dive bar/burger joint that stands as the lone blue-collar joint in the Tony Cherry Creek neighborhood. It is a favorite of locals and visitors alike and offers some of the best green chili cheeseburgers in town. Biker Jim’s – A food cart-turned-brick-and-mortar restaurant, Biker Jim’s serves up the best sausages in town. Meats like pheasant, bison, reindeer, wild boar, and rattlesnake are seasoned and stuffed into sausage before being topped with cream cheese and onions caramelized in Coca-Cola. Santiago’s – This ubiquitous Denver-based Mexican chain is a staple for city residents. The food is authentic, the prices are cheap, and the green chile is hot – just the way Denver locals like it. Buckhorn Exchange – Denver’s oldest restaurant proudly displays liquor license #0001. The Buckhorn Exchange specializes in wild game including ostrich, yak, elk, quail, bison, and alligator. The walls are covered with old western memorabilia and stuffed animal heads from all over the world. Casa Bonita – The Disneyland of Mexican restaurants, Casa Bonita was already famous before it made a cameo on the popular television show ‘South Park.’ While the food is nearly inedible, visitors come for the experience. A jungle atmosphere, caves, roving mariachi bands, live shows, and a three story waterfall with cliff divers make Casa Bonita a delightfully kitschy experience. Denver is a beer city. It constantly ranks as one of the top beer cities in the nation and plays host to the Great American Beer Festival. Even the former mayor (and current Colorado governor) is a former brew pub operator. Because of this, there are plenty of great places to drink beer in Denver. Wynkoop Brewing – The first brewpub in Denver, founded by now-Colorado Governor John Hickenlooper. Wynkoop offers great beers and an incredible atmosphere in an old brick warehouse in the heart of the Lodo neighborhood. Great Divide – One of the oldest and largest breweries in Denver and located right downtown. Tours and tap room tastings are offered every day of the week. Falling Rock – The best beer bar in Denver (and possibly in the US, according to some), Falling Rock offers a wall of taps and an extensive bottle list providing craft beer aficionados with all the obscure and hard to find beers they crave. Williams & Graham – Denver’s newest speakeasy offers a prohibition-style secretive drinking establishment (you enter through a faux-bookshelf door). Classy cocktails are served the old-fashioned way with hand chipped ice and panache from some of Denver’s best bartenders. Lodo is a popular place for the young and the young at heart. Bars like The Sports Column, The Tavern, and Jackson’s pack their rooftop patios after Colorado Rockies baseball games while locals and visitors alike fill the upscale clubs and restaurants that line the fronts of Blake and Market streets. While Lodo has the densest concentration of bars, restaurants, and clubs, every neighborhood has its own commercial strip giving visitors a great way to get a taste of local Denver life. Highland Square, Pearl Street, Colfax Avenue, Lohi, and South Broadway all provide refreshing local alternative nightlife scenes. The Brown Palace – An elegant and historic hotel in the heart of downtown. It has played host to presidents, royalty, and pop icons. For those such as myself who can’t afford the elegant prices that come with it, a visit to the afternoon tea ceremony in the lobby is a suitable alternative. The Curtis – A much more affordable hotel that offers a unique and whimsical alternative to the high class of The Brown Palace. Each floor has a unique pop culture theme (think one hit wonders, sci-fi, etc.) that is carried through to all of the rooms. For more places to stay in Denver choose from the largest range of hotels, apartments, and guesthouses with our partner Booking.com. You get free cancelation on most rooms, and in most cases you only pay when you stay. Larimer Square is a unique Victorian era street that offers boutique shopping and dining in Lodo. Just a few blocks away sits Rockmount Ranchwear, providing a one-of-a-kind shopping experience. Rockmount introduced the first Western style snap button shirts and is still the premier supplier of the iconic clothing to clients in Hollywood and all around the world. Just down the street from Rockmount Ranchwear is The Tattered Cover Bookstore. Located in an old warehouse, the independent bookstore is one of the largest of its kind. It’s an incredibly atmospheric store with ancient hardwood floors, exposed bricks, and plenty of comfy chairs and hidden corners to settle into with a good book. As I mentioned before, Denver is a beer town. Part of this reputation comes from the host role the city plays to the Great American Beer Festival each year. The festival is the brewing industry’s top competition and public tasting session and there is no other place in the world where you can find more beers on tap. Every October, More than 450 breweries come together to pour more than 2200 different beers to thirsty festival goers. Visitors can find EVERY type of beer at the festival and many types they never even knew existed. Denver has a comprehensive bus system and an expanding light rail and commuter rail network, but the most fun form of public transportation are Denver’s community bicycles. Denver was the first city in the United States to find sustained success using the bicycle as a large-scale form of public transportation, and bicycle sharing stations have been popping up all over the city since. For just a few dollars, guests can pick up a bicycle at one of the check-out stations and ride it all over town before checking it back in to another station. Late summer in Denver is spectacular. In early September, the city is still in full on summer-mode with residents flocking to the outdoor cafes, rooftop patios and the parks in the largest public park system in the United States. But within a short drive, the mountains are beginning to show the signs of autumn. This is the time when the aspen leaves flash their vibrant gold hues, lighting up the slopes of the Rocky Mountains. Visiting in late summer provides visitors with the best of summer and autumn in Colorado. Rocky Mountain National Park is the most accessible national park from Denver and it couldn’t be more different from the city experience. Visitors are treated to majestic mountain views, unique wildlife encounters, and amazing hiking opportunities amongst the alpine wilderness. Icy glaciers, glassy lakes, and the iconic Longs Peak all compete for attention along the continental divide in one of the crown jewels of America’s National Park system. Denver is incredibly isolated – the closest big cities are Phoenix and Dallas which are both more than 14 hours away by car. Thankfully, Denver has one of the largest and busiest airports in the United States. Three major airlines use Denver International Airport as a hub – United, Frontier, and Southwest. This competition helps keep the prices in and out of Denver relatively cheap. Denver has an excellent music scene. While it might not be as famous as Austin, Nashville, or New Orleans, there is a growing folk/Americana movement with groups like Paper Bird and singer/songwriters such as Danielle Ate The Sandwich and Patrick Dethlefs. Additionally, the indie scene is healthy with bands like Tennis and Hindershot gaining traction. Denver has also recently been a launch pad for larger, mainstream acts as well. Groups such as The Fray, One Republic, The Lumineers, and The Flobots have all found international fame after recognizing popularity locally in Denver. Visitors can check out the music scene first hand by stopping by one of the many independent music venues throughout the city. The Hi Dive, The Walnut Room, Larimer Lounge, and The Marquis Theater are all great places to check out the local music scene. Alternatively, visitors can turn their radio dial to 1340 am for Open Air Colorado, a Colorado Public Radio station that plays local, independent music. Work comes second to play as residents take ‘powder days’ off from work to hit the slopes on exceptionally good snow days, pack their backpacks for extended camping trips, or strive to summit every one of Colorado’s 53 14,000 foot (4260 meter) mountains. Denver offers the best of both worlds with all the amenities of the big city and the Rocky Mountains as its backyard. Booking.com has over 800,000 hotels, apartments and hostels worldwide. You get free cancelation on most rooms and a best price guarantee. Check out these awesome tours of Denver with our partner Viator. BIO – John is a perpetual business traveler who spends the majority of his life on the road meeting with clients all over the United States. Since he’s in the office for eight or nine hours everyday, he strives to make the most of every travel opportunity and shares his tips and tricks for doing so at his blog. Follow along at the Travel Rinse Repeat Travel Blog, on Twitter @TravelRinseRept, or on Facebook. Do you have any tips on what to do in Denver?Please share in the comments. I go to the US (live in the UK) 3-4 times a year and people think I am weird. I love it and there is some sort of magnet that takes me back everytime. Thanks to you, I am going to have to find yet another excuse to to again.. and this time to Denver. Been reading quite a bit about it recently, and think we will love it. I will absolutely show you around! It’s a really fun city with a lot to offer. What’s crazy is that there are EVEN more opening up. Two have opened within walking distance of my house in the last year alone! Wish you would have published this 10 days ago – we just went to Denver for a friend’s wedding. We made it to Red Rocks and explored the downtown area, but there is so much more to see – will definitely refer to this guide next time we’re in town! We stayed at The Curtis, btw – it really is a great place to stay and we loved the different themes on each floor. I love the Curtis…it’s such a unique hotel. I think they’ve rebranded it as a doubletree since I wrote this, but from what I can tell, it still maintains a lot of that original character. Just put this in my bookmarks folder. Recently, I have been on a Denver obsession, and this just pushed it over the edge. I think I’m going to have to visit in October for the beer festival. I think I’m going to fall in love! It is certainly the best festival in Denver (in my opinion) and one of the best I’ve ever been to anywhere! Definitely a good time to visit. Thanks for the informative post. Denver is a great city filled with great people. I can’t say that I’ve ever eaten wild boar before, but that sandwich looks pretty tasty. The wild boar is one of my favorites! That and the Elk Jalapeno Cheddar. I’m dreaming about it now. Had never really thought of visiting Denver, but it actually sounds pretty good. I especially like the fact that there are plenty of breweries there! It’s not on most people’s vacation lists…usually people fly in and drive straight to the mountains. But if you’re ever going skiing in Colorado, I think Denver deserves at least one day. I spent a good bit of time in Denver as I was growing up, but have only been back twice as a grown-up (relative term, I suppose). The city is full of so many things I’d love to explore. I had friends who rented an apartment in Lodo last summer to escape the Houston heat, and they raved about the place, especially the food trucks. John, you’ll be my tour guide when I return, right? I see a Mile-High Tweetup in the works! I’m a Colorado native and go to Denver pretty often. Great post, you were pretty spot on about the city. I would highly recommend for anybody and anybody to stop by Denver, if not Colorado in general. Right now Colorado is going on over 120 open breweries with over 100 new breweries that have received their licenses to open business this year alone! I live somewhat close, yet hager never made it up there. This is a great starting point for when I go. Thanks!! great advice!! wish we had had more time to explore when we were visiting in june, but definitely plan to return! I was completely sold on Denver as I read this and then I got to “there is a growing folk/Americana movement with groups like Paper Bird and singer/songwriters such as Danielle Ate The Sandwich and Patrick Dethlefs.” I’m on my way. I like how Denver is so outdoors-oriented. And I’ve heard that autumn in Denver in spectacular – I’d love to see it! I have never visited Denver, but it definitely seems that I should…. Great guide to a great city! OK – i’ve got my next Denver visit planned. STAY at The Curtis. EAT at Casa Bonita. ATTEND the Great American Beer Fest & TAKE IN some local music. LOVE this!! John – I am bookmarking this. I want to visit Denver soon, but I’ll also be there briefly on my way to Boulder. Your dining recommendations will sure come in handy! I got to experience autumn in northern Colorado and it is spectacular. Besides Rocky Mountain National Park, I think I missed most of what you listed here, though I do think I saw Confluence Park on our way to wander through downtown Denver. Loved every moment of Colorado, I hope I’ll make it back one day. Denver is a really cool place. Red rock’s is a cool place. 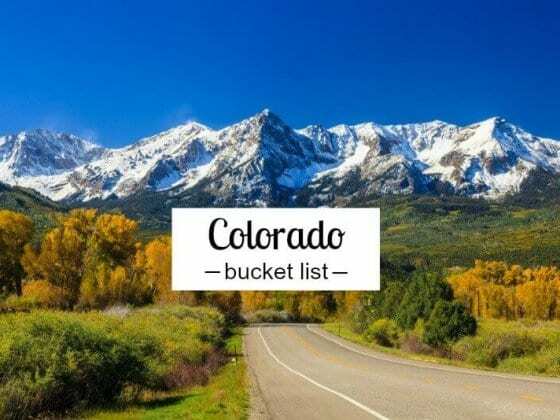 Loved reading about all the things to see and do in Denver, we have been vacationing in Colorado and visiting the city of Denver for years and we love it! We wrote about our recent adventures in Colorado which you can read about here. We will defiantly be taking your list along with us the next time we visit Denver, thanks! This is a fantastic article! In dealing with tourists to Colorado myself this offered a wealth of information for Denver in a nutshell. I have referred many of our customers here when asked about Denver Information. Thanks for the great article. Hi! I found this via Pintrest & just wanted to say thank you for the great article 🙂 I’ve always wanted to visit Denver & now it looks like my husbands job is going to give us the opportunity to do just that & get paid for it! Actually more than visit, he’ll be working in the Golden area for 6 months to a year. I’m super excited though. I have kind of a silly question, but I was wondering how much snow does Denver actually get? I’ve always had the idea that it was a lot & that getting snowed in was frequent. However, what I’ve heard is that in Denver its actually not like that, that its further west & higher in the mountains that really get a lot of snow. Snow doesn’t really bother me, I’m just curious. Thank you so much for the great info !!! I am a little surprised to know that the state doesn’t have a robust tourism industry. It’s a bit unfortunate that it hasn’t been able to cash in on the wide array of outdoor activities it offers to its tourists. This post is right about everything but the following: Denver IS a food city and was even in 2012 when the post was published. Check out the following: Root Down, Uncle, Steuben’s, Bittersweet, CafeBar, Vesper Lounge, and the list goes on. Denver seems like a great place to visit. It has a unique culture and it must be beautiful, being right up in the mountains. That must be fun to be able to take an afternoon off to go skiing. I may be going there soon on business so will get to see the city for myself. Denver is a great city! I’m a native and love it here. We love to have travelers visit. Denver is a great place to visit and a great place to live. My husband and I have been to Colorado twice in the last 3 months. We went to Ziggies, the oldest blues bar in Colorado and we had the best time ever. Open 7 days a week. We went on a Sunday, jam night. Great music and the owners is a fantastic person. I loved your article! I live in Denver and I feel like you highlighted some of Denver’s best angles. Spoken like a true native, you explained Casa Bonita and even gave a great insider’s view into things that often get skipped over like Denver’s wonderful dive-bar music venues. You even taught me a thing or two- I had no idea that Cheeseman had such a sordid past! Thanks for your lovely homage to our home; it’s a truly great snapshot of our city! Glad you enjoyed the article Courtney. Love Denver and Colorado! You should check out Call 2 Arms Brewery next time you’re in Denver. Very good. Thanks for the tip. We will for sure!